I wouldn’t mind waking up next to a mountain range for a couple of years – not that trees and city roads don’t have something to offer. And though I’ve lived at the ‘beach’ for nine years, I have yet to live close enough to hear the waves on shore and the seagulls squawk. I will drive past seven mountains on the way to my morning oil change at Oil Can Henry’s In Redmond where Bill will give me the local paper to read in the comfort of my car. There is a screen with three angles so I can watch them check my fluids, tires, and battery. After a windshield wash and my signature I’m free to go as they open the bay door – it was also keeping in the last of the heat, but as they build a sweat the cool temperature will be refreshing. It will be another 27 miles before I decide to stop for gas – and the one time I get a photogenic gas station attendant the lighting doesn’t work for the picture, but I’d like to thank Matthew of Madras for the spirit and friendly conversation anyways. With my car feeling full and fresh in the engine, and covered with death and dirt on the outside, and crumbs and leaves on the inside I make my way into Boring. I try to look bored or feel that way, but it seems this towns name is an oxymoron – which seems to be a running trend here in the Pacific Northwest. I have to agree that their tactics work at keeping tourists away – unless you’re in Portland or Seattle. I first got introduced to Dave’s Killer Bread in San Diego during the Earth Fair in April, so it was neat to be able to go by its Bread-Quarters, but only to find out that tours are no longer available as some of their clients find it bad for health code reasons. I can still buy their fresh and frozen bread, shirts and hoodies, and spreads from other local companies. I get a loaf of 21 Whole Grains and then some sesame-cranberry peanut butter and vanilla-espresso almond butter from Wild Friends. Both butter flavors are tasty, but the peanut butter proves to have too much oil in it and doesn’t travel well. It will leak in my cooler (thank goodness for the extra napkins in there) and I will still have to pour some oil out when I get home. I’m thinking of going back to big name peanut butters while I travel – as the stir-well variety have a tendency to end up with oil in my cooler and butter all over my backseat when trying to prepare lunch. Across the street just so happens to be another bakery – Bob’s Red Mill. 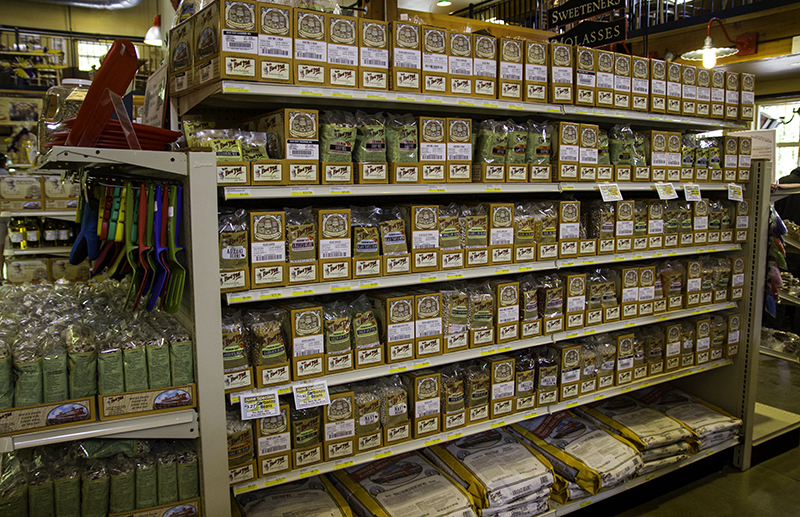 Some of you might have seen his products on a small shelf in your local grocer – seeds, flours, grains, beans, and oats. I’ve maybe seen ten varieties when I go to the store, so I was completely overwhelmed to walk into a store/bakery/restaurant dedicated just to him and his products. I bought some vegan baked goods after looking at the kids art, the history, the kitchen tools, the spice rack, and sweetener aisle. I had another bakery to get to. 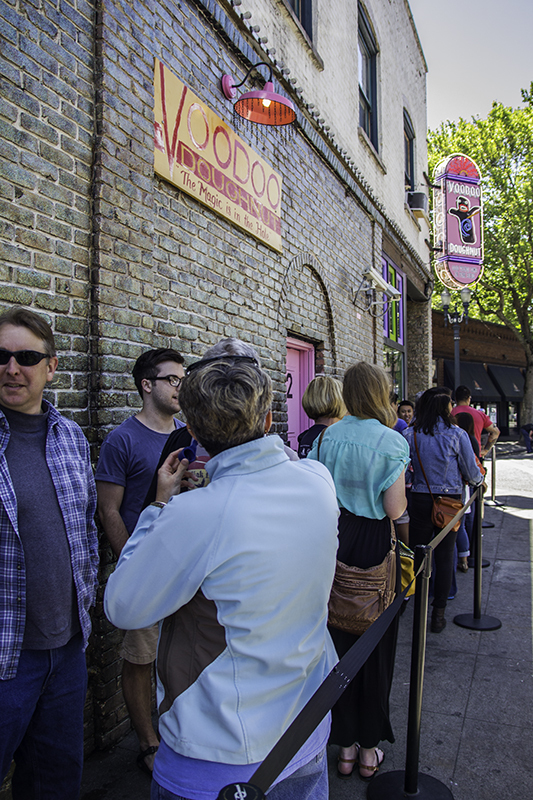 Eight miles away on the other side of the Willamette River was my main reason for stopping in Portland – Voodoo Donuts. My dad recommended it for their Bacon Maple Bar that has also been made into a beer by Rogue Ales also local to Oregon, but I will be having neither today. I thought I got lucky by finding parking within sight of the line outside the door. I was able to join at the end of the line marker and 25 minutes later would be having my VD put into a pink box. I didn’t know which donut to get and didn’t want to hold up the line when I got there, so I pulled a napkin out of my purse and began to make a list. I ended up with a dozen. Some are regular donuts with cool names and others have chocolate and peanut butter on them – some of my favorite food groups. Lots of sexualness in this place – talk of balls, and holes, and VD. They have undies for sale and a donut named Triple Chocolate Penetration. While waiting in line I had asked the guys in front of me if there was anything else nearby worth waiting for. They recommended a coffee shop and when I came out with my big pink box full they asked if I would like to join them. I told them to let me check the meter for my car first and quickly changed my mind. I had paid for 38 minutes. I didn’t get a ticket for going over time or not posting it in my curbside window, but for lack of activity. The parking ticket was $90 and upsetting – I can’t read parking signs. I need to learn my lesson already and just use garages in large cities – there are less confusing multitudes of signs to read that way. The guys go on without me and another guy approaches asking if I’ve got a rolling paper – better to ask for what you want than just the money for it. I contemplate smoking with this guy, but my time in Portland for this visit is over. I eat a few donuts while I dwell in my disappointment and some of them are too sweet – I still prefer a lightly frosted maple bar over any frosted and sprinkled donut. I pass a street of food carts and wish that I had read the parking sign better so that I could be out exploring all the city has to offer. I had planned on spending the day here, but when traveling on a budget (as I always do) I am forced to only allow myself to spend so much in one place. Crossing the state line into Washington I text Uncle Ed to let him know I will be arriving tonight and he warns me of Seattle traffic. Well, I got extremely lucky. Google maps says it takes 4 hours and 23 minutes and according to my info it took me 4 hours and 18 minutes. I was worried for a minute when I saw the electric speed limit sign change to 30mph. 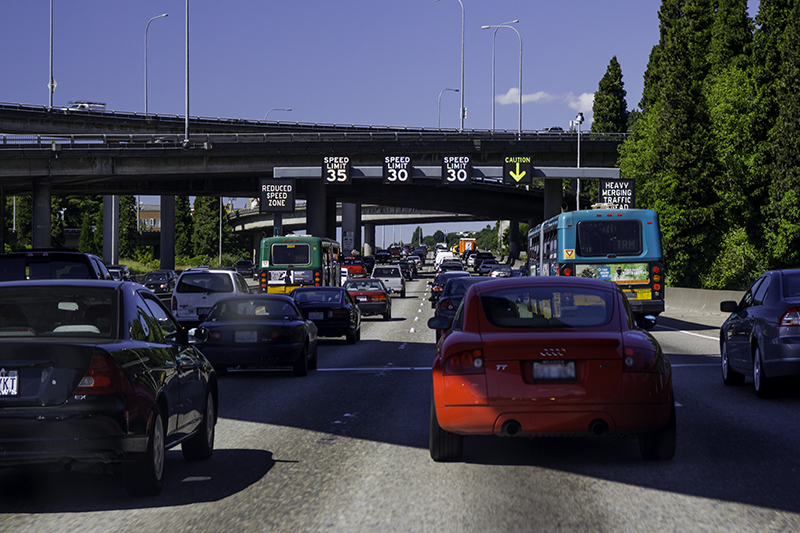 Traffic varies so much and some cities use wait times, but Seattle lets you know by speed. I would’ve been able to save some time and distance had I taken the ferry from Mukilteo, but I didn’t know it’s schedule (every 30 minutes) and didn’t feel like driving there to find out. I took Exit 226 to detour around the bridge on the 5 that had been broken down by a semi truck recently (seeing it in the news I thought it was a historical event – seems some things need more maintenance and repair). 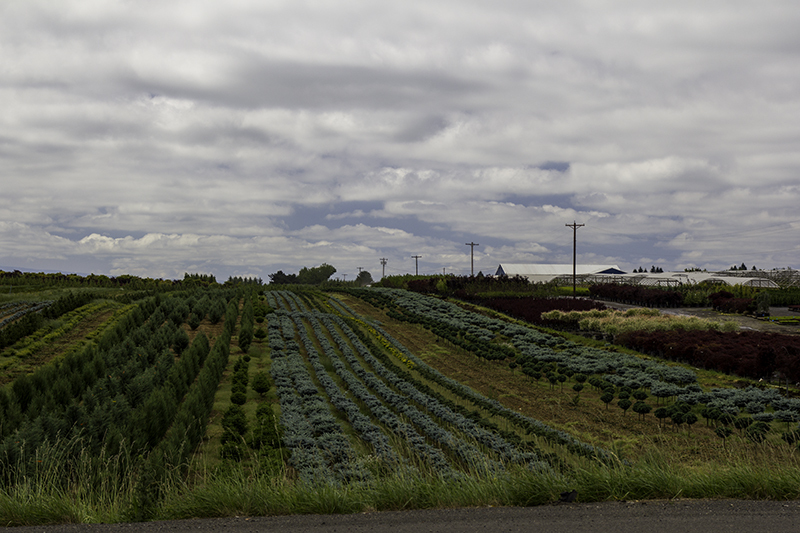 I could’ve taken a more scenic detour – some small roads near the coast, but felt done with driving for the day. Along the way I would see two signs that made me giggle. The first one: seat belts must be worn day and night – as if someone thought the power of the moon would save them. The second: a pet adoption agency mentioned as a tourist attraction – some people go to visit mickey mouse and now they can buy his brother. Ed and Lorraine, his wife of 25 years, don’t let my arrival mess with dinner. I get a water and a seat and conversation. I declined any salad due to the recently large consumption of donuts I participated in. Tonight’s festivities would include a tour of the house: comfy chairs in living room, newly remodeled kitchen, room where I will be sleeping, craft room, bathroom, and garage with motorcycles! Outside: birds at their feeders and a random cat that doesn’t belong. I ask to play Cribbage since it has been a month since I last played. My memory doesn’t fail me too much and since I won the first game I’m left on my own for the second – I lose. Later, Ed will play the guitar for me and then Lorraine will present me with gifts. I receive a birdhouse wind chime that I get to paint myself, a set of green pillowcases with ice cream sundaes on them, and a white knitted hat (by Lorraine) that fits. Ed doesn’t have to work tomorrow which means I get to go for a motorcycle ride, but he’s still on a schedule of getting up at or before 5:30 am which regulates bed time – which means read then sleep. This entry was posted in Family, Food, Government, People, Places, Plants, Things, Travel and tagged bakery, Oregon, ticket, Voodoo Donuts, Washington. Bookmark the permalink.